Farm Frenzy 3 (v1.0.1) — Mobers.ORG — Your Daily Source For Mobile FUN! So you think you've mastered farming sims? Try running five exotic farms in one game! 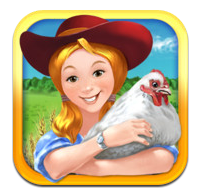 Farm Frenzy 3 challenges you to revamp farms from around the world that need your help! Conquer Farm Frenzy 3 and you may even find yourself president of the Farmer's Union!The Frenzy goes global as you compete in 95 fast-paced levels in places like the South Pole, Africa, Russia, the Wild West, and the untamed jungle. Feed 30 wild and crazy animals including walruses, penguins and llamas, while protecting your farm from dangerous jaguars, lions and bears! Can you beat the highest score on Game Center or OpenFeint and prove you're the best virtual farmer in the world?